This cake looks wonderful. One of my favourite summertime cakes. I love the holes! Looks really yummy! Look so feather light. The Americans here called this cake Angel Food Cake and usually serve it with cream or mix fruits compote. I think your name sounds better. How pretty and light these look!! 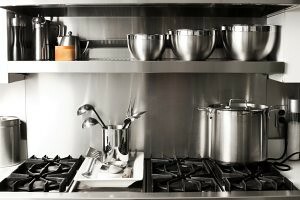 Oh, you make me want to bake more! 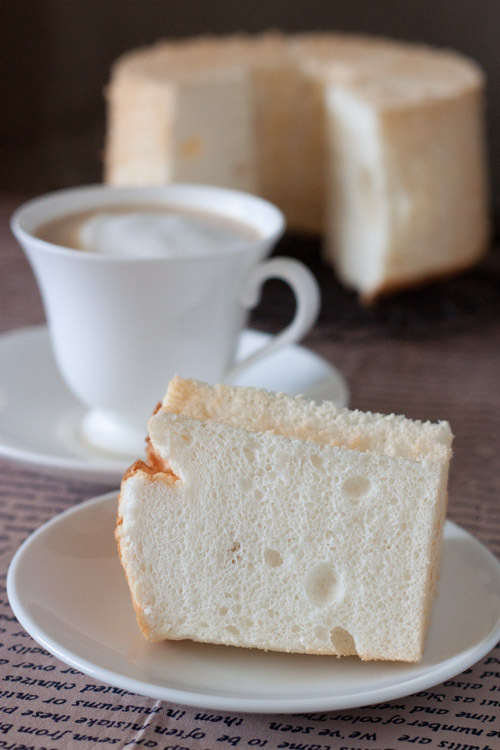 Love this healthy light chiffon cake. Definitely want to bake it for sure! Shirley, the chiffon looks so nice. This is one baking item which I have yet to master. Mine turns out short but taste is ok. Sigh! Angel food cake and Chiffon on a plate?! Done and done~!!! My last attempt with angel food cake was a total flop! A delightful cake, light and fabulous. Just perfect with fresh strawberries that are now appearing at the Farmer's Market. i always mess up on chiffon cake. the texture of yours is PERFECT!! looks beautiful and so delicious. i can just imagine biting this light and fluffy cake and eating it with some fresh berries and cream! Look so so light and white! well done! In terms of texture and taste, how is this cake differ from the normal chiffon? Heard that it's usually served with cream, fruit compote or sauce, does it mean it's drier and not as moist like a normal chiffon. 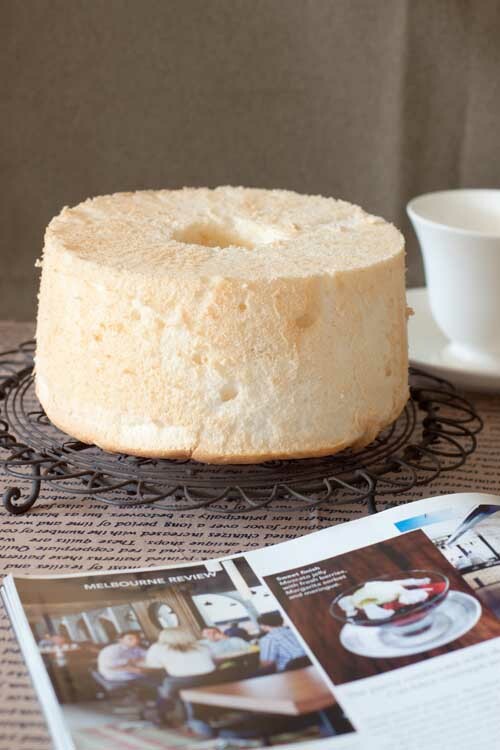 For the normal chiffon we can just eat it plain, how about this angel cake? Thank you. @Anonymous : This cake is not dry at all. It is very tender and moist. 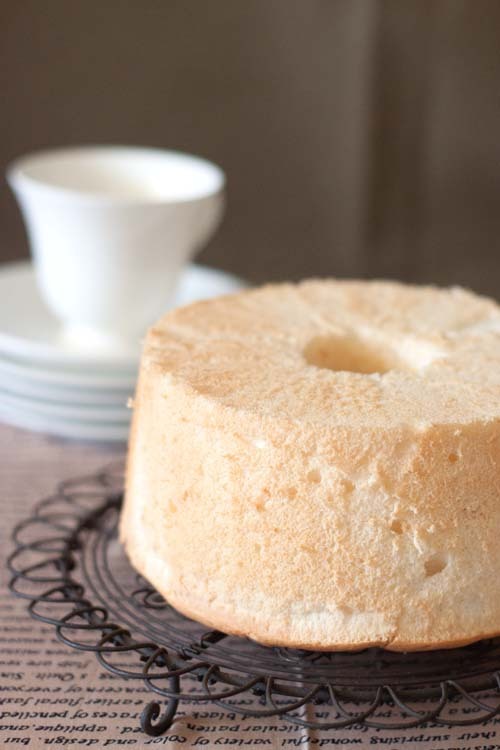 Usually Chiffon cakes are very suitable to be served with ice cream or whipped cream because they are light. For the angel chiffon, it is even lighter because there is no yolk. My cake turned out super moist and tender. 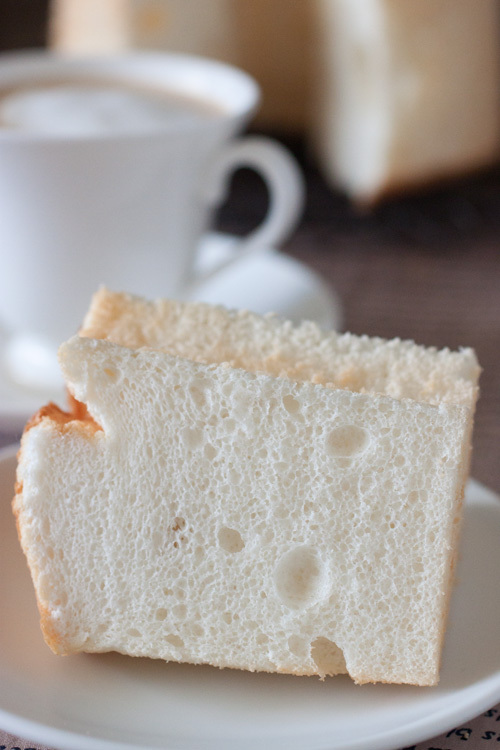 You may need to be more careful with angel cake as some people have found it difficult to get the right stability for the egg white foam -especially with a recipe like this, without baking powder and other stabilisers. I am very comfortable working with pure egg white and sugar - some other people are not. Also the extent to which you beat the egg white determines if your cake will turn out fine and moist. If you beat until the peaks are too stiff, your cake will turn out coarse and dry. Of course, the downside of under beating it will result the cake collapsing.